Special Notes: To ensure passage, boaters must arrive at least 30 minutes prior to closing. Swing bridge with a clearance of 1.3m (4.2 ft). Bridge swings on demand. Lower docking (with power) is limited (8 spaces) due to the blue line dock. Of Interest: One of the four remaining Unequal Arm, Center Bearing timber swing bridges on the Rideau, this beautiful swing bridge is so well balanced that one person can swing it by simply pushing on it. A sawmill existed here at the time of canal construction and a bypass channel was cut in order to leave the mill intact. 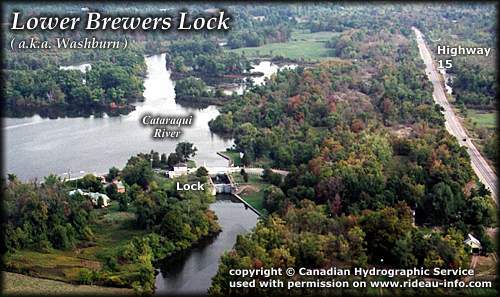 Water power continued to operate mills in the 19th century and still operates a small hydro-electric station today. Doner Studio (metal art) is located in the old grain storage elevator near the lock. An apple orchard is located just down the road at the junction with Highway 15. Notes: Gas is upstream at marinas in Cranberry Lake and Seeleys Bay. No local services. Solitude lock.